The public is invited to come to both the demo and the slide talk. It would be great to meet you in Kansas! So come on out. It appears that Sam's stimulus package has arrived! This just in from the mega booth of Sam Taylor, Hayne Bayless, and Meg Little. Doesn't look like a lot is happening on this first day of wholesale at the annual American Crafts Council Show in Baltimore. 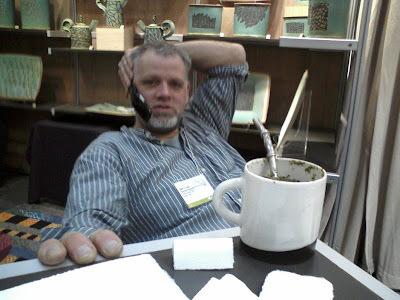 Here is Sam having yet another cup of yerba matte. Sales data is unavailable at this time. There were some buyers spotted in Jeff Kleckner's booth down the row. Good luck folks! It was a beautiful clear day. Cold and windy, but nice. Micah Cain came over for some heavy lifting and general schlepping of stuff still stored away and almost forgotten over Micaville way. We stored my booth up in the attic space in between truss framing. We moved a hydraulic press and the old Peter Pugger, among other things. While we were there we ran into my old buddy John Snyder who was also moving some things out of storage. John insisted that I take a couple of nifty tables with wheels he had built and no longer needed. I graciously accepted and we piled'em on the old Ford. After looking over the tables, I had a hunch that I could possibly use one for my Shimp wheel. I hadn't had the time to build my table, ball opener, and splash pan for the Shimpo, and it turned out after removing the top piece of plywood that the lower shelf was just the right height for the wheel to sit. I like my wheel head to be just below my hips and that it was. I locked the wheels and off I went to test it out. I threw a ten pound jug. The clay was just right and the table was fine. I'll consider using it permanently if I can add a wooden splash pan and ball opener, which shouldn't be a problem. I'm working on the "set list" for the Kansas State U. workshop on Friday. I'm really excited to go there and show them some of what I do. I'm not positive, but I think it's open to the general public. I'll find out for sure. It would be great to see you there if you're in the neighborhood. I'll also be doing some brushwork demos, as well as a brief lecture that evening. More on the set list, lecture, and access to the workshop in the coming days. Just to keep the balance of employment here in Mitchell County, we've decided to hire Lillian back to do some sub contracting. She will be in charge of feet and other trimming/cutting duties. Since she is underage please don't post or share this information. We wouldn't want to risk having her parents hauled off to the pokey. overglaze enamels, and underglaze iron. Going through my boxes of stuff, I finally found the books I thought I had lost or misplaced. A while back I promised to share a story that I recalled from my bio of Ogata Kenzan. Well, it turns out I had it all wrong. It is a quote from Rosanjin, whose real name was Fusajiro Kitaoji. 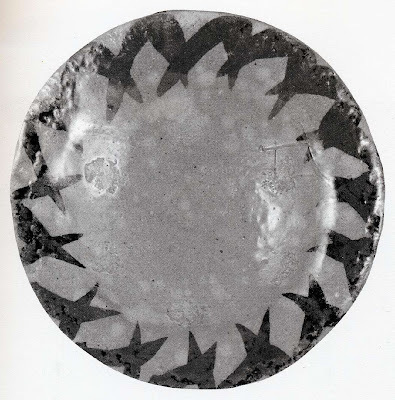 It comes from the book"Uncommon Clay: The Life and Pottery of Rosanjin" by Sidney B. Cordoza/Misaaki Hirano. I read this quote as I dedicated and lighted the first fire of my, then, brand new kiln in 2002. It summed up the experience I had with building the kiln and now is again appropriate at this stage of studio construction. It happens to everyone who climbs Mt. Fuji. When you reach the last station or two, you push on excitedly, the members of you party encouraging one another despite their weariness, everyone aware that the peak is near. Then it happens. Looking up, you catch sight of a corner of the mountain and decide that this must be the peak at last. Pulling yourself together, you climb on in high spirits, only to find, to your consternation, another corner rising above the first. Surely this is it, you think, and climb hopefully on, but again the mountain does not stop. Only after several rounds of this sort of thing does one reach the top. The ascent is difficult, but anyone with mettle enough to climb will surely conquer all difficulties and reach the peak. For whatever reason, once a person reaches the steep places of life, all too often he or she turns back to where the going was easier. 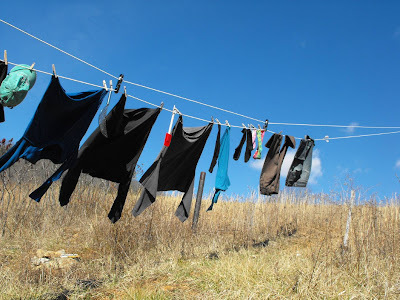 Of course, in life's climbing expedition there is no peak, no limit to how high you can go. There is always a higher level, always a more elevated plane. Not a lot happening in the shop this morning. 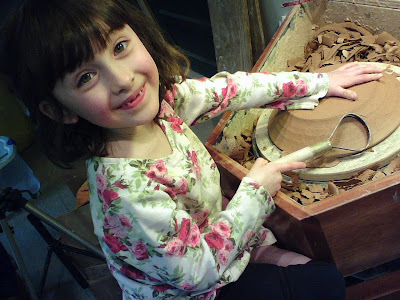 The girls are home from school and we're brewing up a couple of projects, i.e. 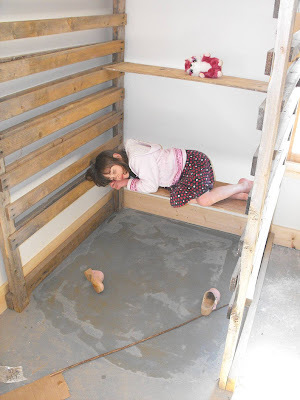 a bunk bed for their "American Girls™ , some long overdue Thank You cards, and regular visits to Mommy's studio, where she is working on some tiny shiny. Here's the state of the pots I've made the last couple of days. 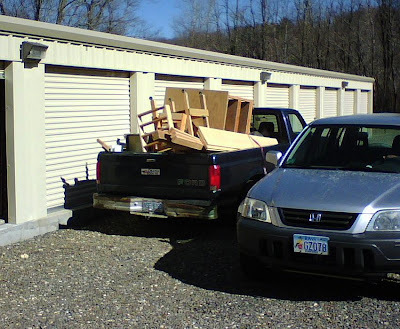 I've been moving more stuff from the "storage unit" in Micaville and sorting through all of it. I've found tons of books, cards, letters, LP's, cassette tapes, pictures, scraps of wood, and old kiln logbooks! There are some really nice old postcards that I've saved from over the last twenty or so years. I'll try to scan a few and post them later. Makes me wonder how we promoted our work before Modern Postcard™ came along. These days there are so many places to have postcards made. If you're looking for a good place to care of your 'dream card' look to Elizabeth Robinson . Elizabeth makes beautiful pots and has a new business designing artist postcards and can now make your postcard dreams come true. (and for a very good price, too!) 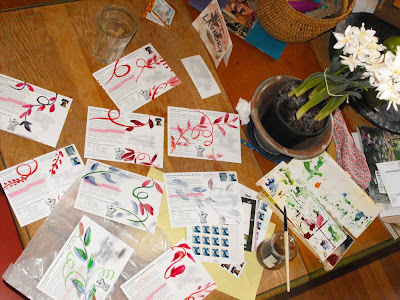 Check out her "Postcards For Artists" website and see a sampling of her designs. 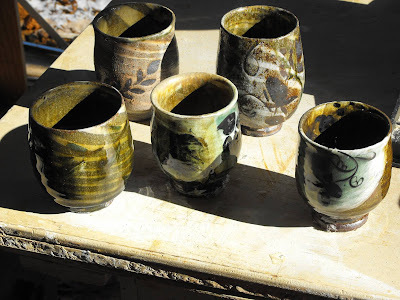 You can also see some of her pots here. I'd better get to work on those mini-bunk-beds! I'll let you know about what happens in the studio later today. Thanks for checking in! 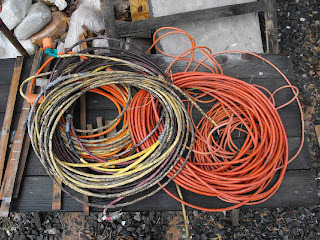 About three hundred feet of 12 gauge and fifty feet of14 gauge extension cords will be eliminated at the Pottery effective immediately. With the advent of alternating current, or A.C., installed Tuesday made this diverse and hard working group of cords redundant. The Kline Pottery regrets that this action had to be taken. The convenience of A.C. was a deal that was hard to refuse. Hopefully this won't happen to these cords. first official water boiled today for coffee break. Notice cord plugged into wall! NOT an extension cord! all the same, all different? Just a few pictures from the morning. 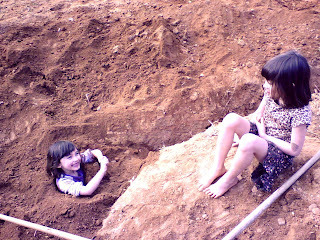 After all was OK'd by the electrician's yesterday, Lillian wanted to get into the trench that we were filling in. 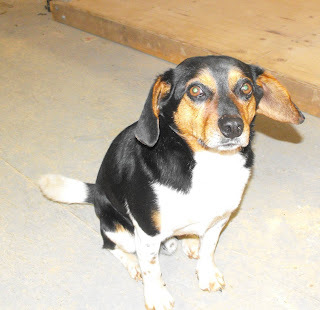 How could I deny such enthusiasm for the red dirt! Unfortunately Evelyn decided she needed to tamp down the dirt around Lillian which made for a more difficult extraction! But she's fine now after her bath. But around here they say once that dirt gets in ya, it's hard to wash it out. I certainly believe that! We'll have to keep a close eye on that young'un and see if she takes to the dirt and the potter's wheel. I wouldn't mind that at all! What a day out there! This one is for Ron. I hope to see these items on a plate really soon. To the right of the door is the drybox/storage rack. 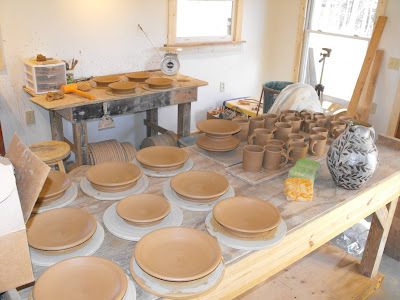 When the pots are finished and ready for the kiln I can slide the ware boards of pots all the way in and stockpile'em. Below, Evelyn tests the strength of not only my ware boards but the dry box rack itself. I wasn't worried about her furry friend(above) but I was relieved when all hell didn't break loose after she put all of her 40 pounds down upon the board. Phew! I guess it's a go! I just have to put this down somewhere. There continue to be galleries that fail to respect artists and think that net 30 means net whatever. We all have bills to pay just as we're all busy these days. But to not return emails and phone calls is very unprofessional. If you are getting ready to go to the big shows in the coming week(s) I would strongly urge that you require COD on any new accounts. Check references with those that galleries provide, AND ask around to get the real picture. Yes, there seems to be a lack of solid pottery content around here. I hear you. Readers are removing their following status left and right, the stats are way down, sponsors are pulling their advertising, boo hoo. What can this mean for the pottery bloggery? Stimulus package! Nothing really new, just a reshuffle! After all, I can't remember the last piece of pottery we've added to the collection?! 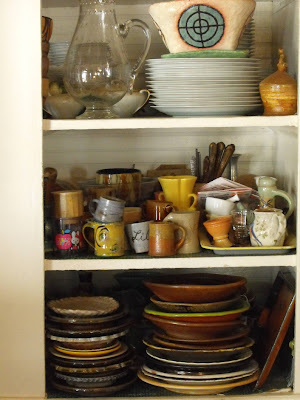 This morning as I emptied the dishwasher, I realized that except for a couple of small plates with partially eaten bagels, all of the dishes are "in the stack", so to speak. 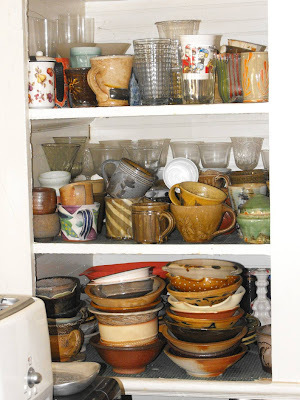 And since I'm desperate for 'content' I realized that it was time for another episode of "Cupboard Confidential". As I stacked up the clean pots and found a stable spot for them I realized that being on top isn't what it's cracked up to be. Sometimes you gotta stack according to size. We wouldn't want the little plates under the big ones, now would we. [There does seem to be some risky business happening in the cereal bowl department! not to mention a lot of teetering.] I'll have to figure out a way to have a contest here somehow. But everybody knows that Brandon will probably win...Have a lucky 13th! I just received this card in the mail. 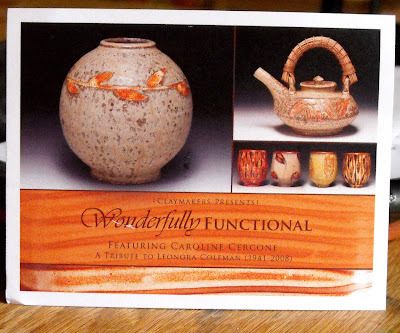 It announces a show of pottery in Durham from Caroline Cercone. 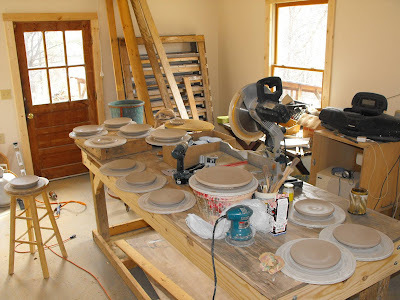 I know Caroline, like many potters, from her many visits to Penland. She has always made very considerate and warm pots. When Stacey and I were on our honeymoon in Charleston, SC, we had a nice visit to the bakery that Caroline's husband owns. 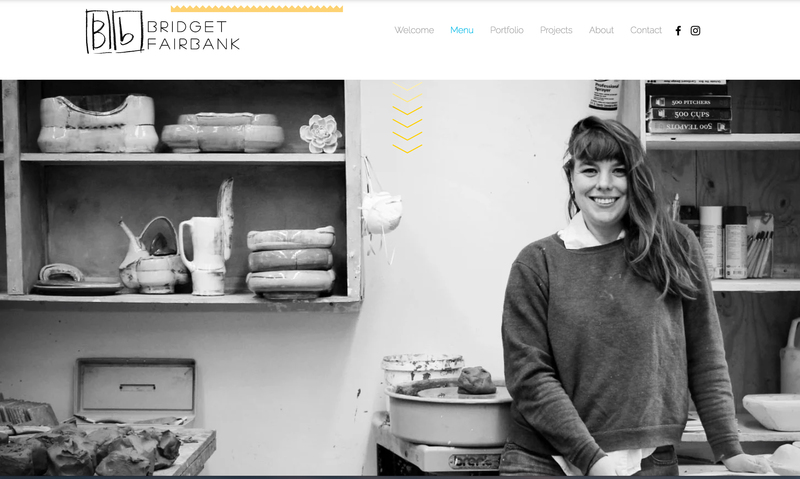 There are several links where you can see some of her pottery. Just use the search box to the right! The electric company said they would 'hook' me up today. 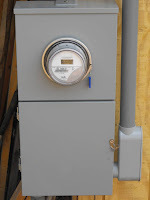 I've never been so excited about public utilities! We'll see. I won't hold my breath. After eight years of extension cords, what's a few more days? 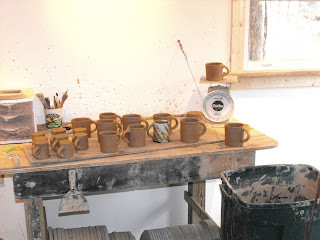 It looks like another balmy day here and I hope to make a few mugs to warm up for tonight's Clay Club mugathon. If you're in the neighborhood of Penland School tonight come by the pot shop and spin a few for the annual mug grab at the Penland Auction. I'm sure they will appreciate it. There's pizza! [I hope I can remember how to make mugs.] Maybe I can get a decent piece of wire up there. Still clip-cloppin' on the treadle wheel and enjoying it. I haven't built my Shimpo wheel stand/ball opener, yet. (But I did build a makeshift tree house for the girls in a giant rhododendron tree we found in the woods behind the shop.) I, of course, immediately started looking for a grouping of trees that I could build my epic tree house. But if I start another project before my wheel stand is finished, I probably should be shot to save me from myself and my endless parade of unfinished projects. That's all for now. Better get up the hill and get to spinning. Another beautiful day here in the mountains. Doors and windows are open. Bees are buzzin'. Back to work before picking up my gals from Montessori School. 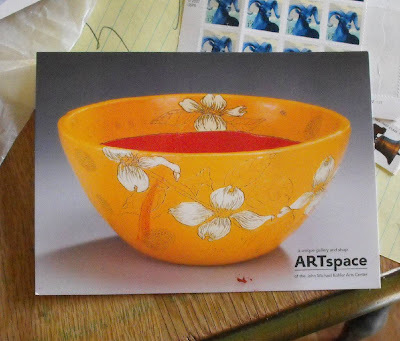 I just received a handful of postcards for the show, "To Have and To Hold" at ArtSpace in Wisconsin! So I saw it as an opportunity to do a little decorating. I should just get some blank watercolor paper and go to some painting, but I always like paper that already has something on it. So many things in this life are just within our reach, like waving at someone we don't know or painting a little something on a letter. 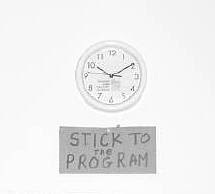 I'll try to use that thought later this morning when I get to work on some pots. I only had 9 cards! But when I get more I'll send some more out. Wouldn't want to miss out on some painting practice! Darnnit, I'm not on the front of the card! Oh well, I can't always be the center of attention. BoooHooo. 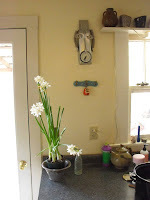 Check out today's "A Plate A Day" blog post! We had a nice hike up to a hill behind our house yesterday. Here is a nice view of the surrounding hills and the pottery nestled below. It reminds me of one of those landscape paintings from China or Japan, that shows the magnificently grand landscape surrounding some teeny tiny human activity within it. 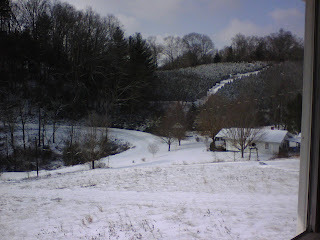 This little walk is sort of "straight up" through a Christmas tree farm just behind our 'homestead'. The weather was unseasonably warm and it was great being out. 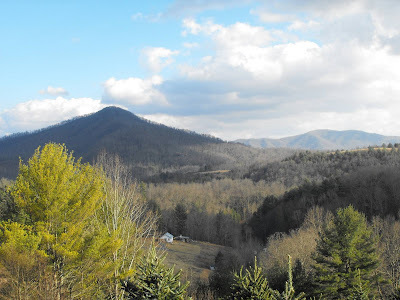 The pointy peak is called Bailey's Peak and can also be seen from the Penland School as well as west in Burnsville. I don't know the elevation of the Peak, but it's got to be over 3000' since our house is about 2600'. The Peak was part of a recent real estate fraud involving international intrigue and millions of dollars. Here's a story. I just thought I would share this as I sit here at my dial-up connection waiting for my airline flight is being confirmed. tick, tock, tick, tock. I'm going to Manhattan, Kansas to teach a workshop at Kansas State University in a few weeks. I hope to go check out the Nelson Museum in Kansas City while I'm there. Does anybody want to meet up? Let me know if you'll be around on the 26th of this month! I've been slogging along this week, knocking out 'little' details here and there. I built a newish work table and revamped my wedging table. 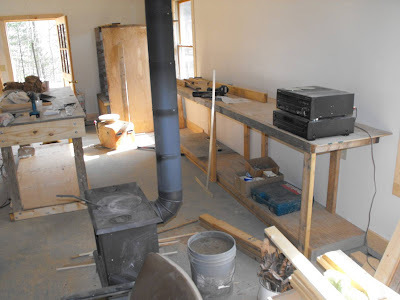 The work table is a little narrower and longer than my previous table to accommodate the space and is scabbed from a table I got from my project buddy, John Snyder. I surrounded the base with a beefy 2X8 skirt and reinforced top for a slamming good time. I will spend a lot of time at this table and I want a table that I can really hammer on as well as sit comfortably to paint pots . I still have to put drawers in the table to hold "stuff". The wedging table isn't what I had planned to build, but I needed something fast and I'll reschedule my dream table for after the next firing. 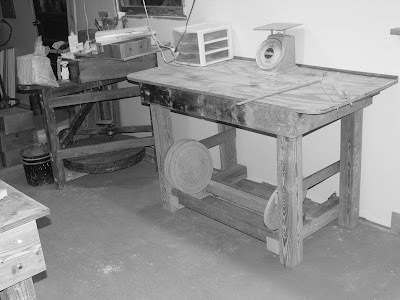 This is the table I originally built at Penland in 1998 and then moved to the Micaville studio. It originally had a concrete top but had been removed to make it a little lighter to move. 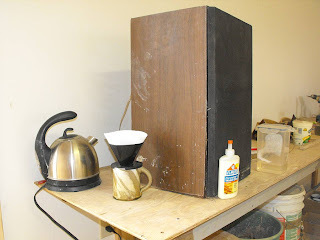 But last summer I 'temporarily' installed the table outside and screwed 3/4 inch plywood to the top. It worked fine! I cut some 30 degree angles in the rails that hold the bats below for a slight improvement. I still need to install my wire clay cutter and get rid of that tacky early 21st century injected molded plastic drawer organizational system. Since I'm still waiting for the power company to come (Wednesday!!!) to pull the main wire and hence have power for my pug mill, I went ahead and installed the old wedging table so I could slam mix/wedge my reclaim. Just more exciting news from the shop that I wanted to let you all in on! The view from the shop this morning. 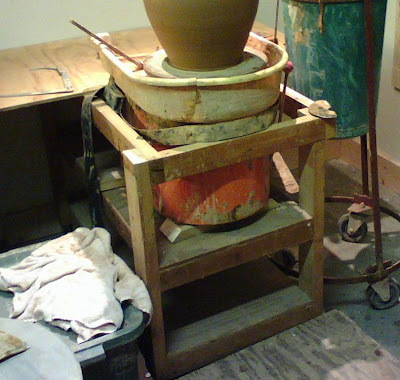 The process of choosing pots for shows, or merely looking at the pots you have just fired can be an extremely challenging task. 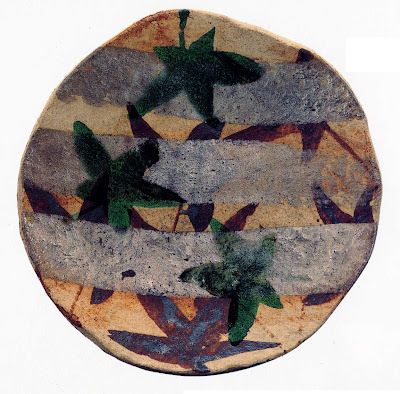 As many have noted the expectations that a potter must put to good use in collaboration with the mind's eye as he/she decorates and glazes their work is a trickster. In the end the gut instinct, the pot that you reach for instinctively is sometimes the best in the eyes of the beholder. Although it may be difficult to assess just by looking at an image on a screen, certain key reactions are valid if not as complete an experience as holding a pot in one's hands. The process of choosing pieces for an exhibition is usually a difficult one for me. I try to balance the group of pots against the individual favorites. I have all kinds of rationalizations that are put into play, just to make a few 'simple' decisions. 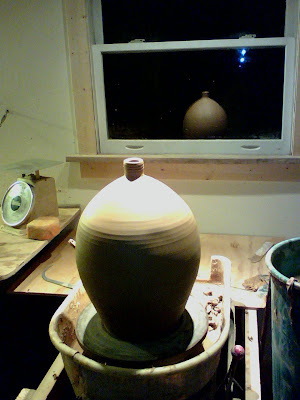 This blog vote was a first for me, maybe in pottery bloggery history. I don't know. I wish there had been more votes and maybe I should have made it more anonymous, maybe next time. The candidates for the vote all made the cut, in my opinion. But to choose the five to sent, I thank you for helping me narrow the field. Here are the pots that I shipped this morning. I'll keep you posted about the online Yunomi Show at AKAR. It opens Friday March 27th at 10 a.m. Thanks for helping. I'll definitely do this again. Before I pack the winners of Saturday and Sunday's voting I wanted to give everyone another chance. I will be shipping them out tomorrow (Tuesday). According to Google Reader, I have 164 subscribers! And according to Blogger I have 57 "followers", so come out of the shadows and vote! So far there are 19 votes. Don't be shy. This morning, after some discussion, I decided to start a project that wasn't on my list this week, It's probably on some long lost list somewhere from years ago. Let me explain...Maybe a year ago I ripped a wall down in our bedroom and put new drywall in its place. In the process I took the door and the trim out. Since then, (it may have been two years???) we haven't had a door on our bedroom. Today was the day to start back on this long overdo project. 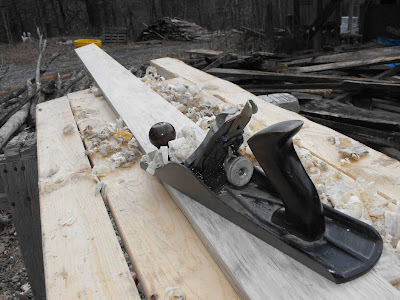 Of course, being me, I couldn't pass up the opportunity to enjoy the use of my Dad's old hand plane (technically, it's called a "jack plane") and thus prolonging the experience and the project. It was such a balmy 45*F that I thought it would be great to distract myself outside(again). Here is a shot of the first hand planed board I worked on this morning. I may do a little carving on it as well. (I hope Stacey doesn't read this for a few days!) Maybe it's selfish of me to involve myself in such an experience, but I can't help myself. I love doing it. Isn't that the point of working? Shouldn't it be? Yes and but who's going to be able to pay me for hand made pottery these days, much less a hand planed board??!! Don't get me started on the impending doom! Back to my pottery reality this afternoon as I am going to get back to some clay work. Reclaimed red dirt is ready for me and as is Tom's porcelain. Which way do I jump? We'll see...hehehe. P.S. 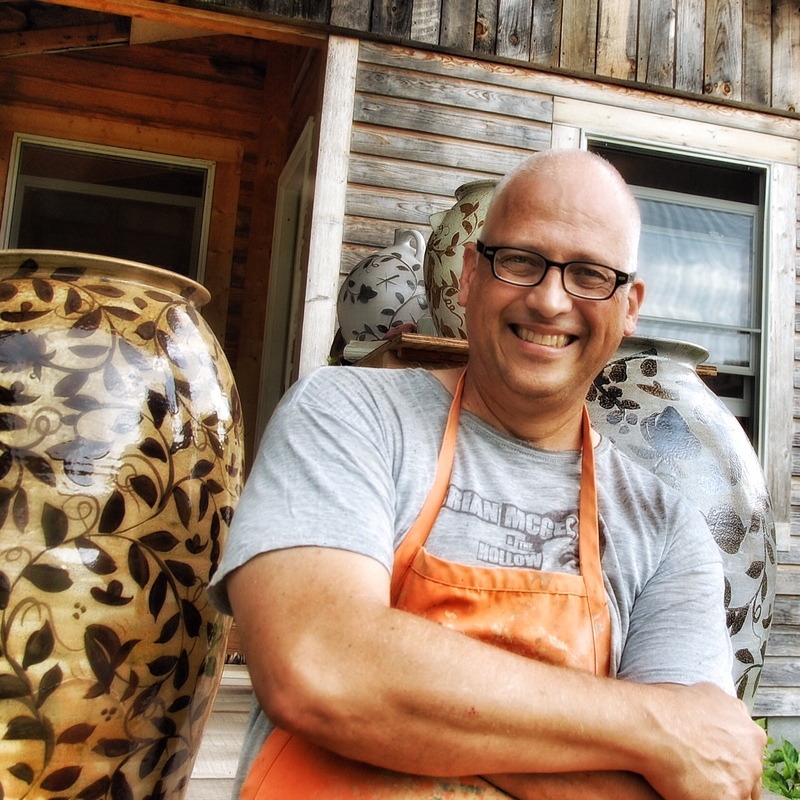 Check out Doug Fitch who has just opened up his kiln full of beautifully warm earthenware! working outside on the new shop with Buck. on the cups I will send tomorrow to AKAR. If you haven't yet, see previous post and send in your vote! frozen and will be throwing more pots this week. I also have some porcelain courtesy of Tom Turner to play with. I'll keep you posted, of course!